Hunters are local peasants accustomed to using their bow for hunting. These archers are armed with a moderate bow and a knife. 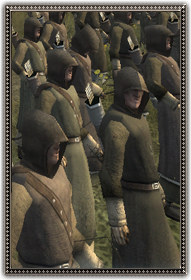 Life at the bottom of medieval society is neither easy or healthy, these units have escaped their terrible lives to take up arms as mercenaries in the service of whomever is willing to pay, or have volunteered to try and gain a better life. They're only moderately effective as archers, and should not be relied upon.